My new coloring book is available in my store. Go check it out. Thanks to Debbie for sending this my way. She was checking out her Craft magazine RSS feed and noticed the guy was wearing the t-shirt I made. Rad. Thanks Debbie. 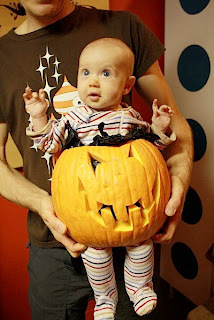 I should mention it's an article about how to dress your baby in a real pumpkin. (?) Check it out. 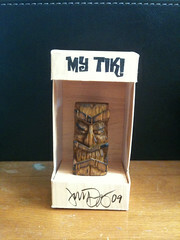 One of three different tikis I carved myself, available for purchase at Open Studios this weekend. I also have new stickers and prints. 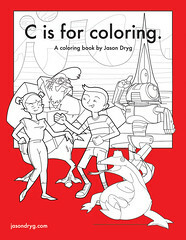 Hopefully the highly anticipated "C is for Coloring" coloring book will be on sale too. Featuring 16 original Jason Dryg images left colorless so you can customize them to your personal taste. I've still got t-shirts, baby clothes, cards, buttons, and googly-eyed owl pins. 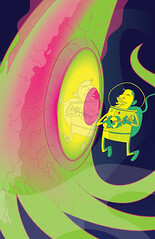 There will also be some new prints available. If you can't make it, the Alternative Press Expo is next weekend, October 17- 18th. It will be held at the Concourse Expo Center, 620 7th street. As always, there is tons of great stuff there to look at and buy. We will be there hawking our stuff as well.